The Core m naming structure is not the big news here though. 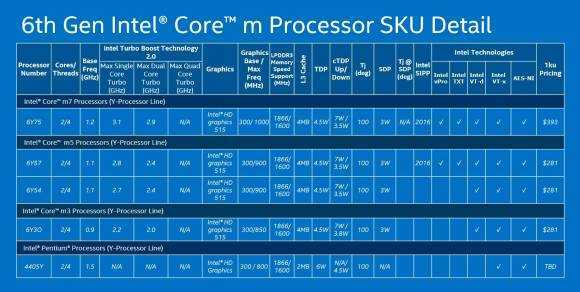 Based on the Skylake architecture there’s lots to consider under the hood. A new CPU and GPU (HD 515) architecture, new power control mechanisms and support for USB C, RealSense, imaging and video compression hardware. There are new security features too and I’ve covered those in a detailed post on the Skylake architecture. This is a big step up from the 1st-generation Core M.
Core m, based on Skylake, is going to bring 1st-gen Ultrabook performance to fanless 2-in-1’s, tablets and ultra-thin laptops with more features and, importantly, a lower price than 1st-gen Ultrabooks. You’ll get office-class performance, more than enough for home, education usage and even entry-level PC gaming. Full HD video editing, 4K video playback and feature such as WiGig and VPro should give manufacturers a wide range of target market options. 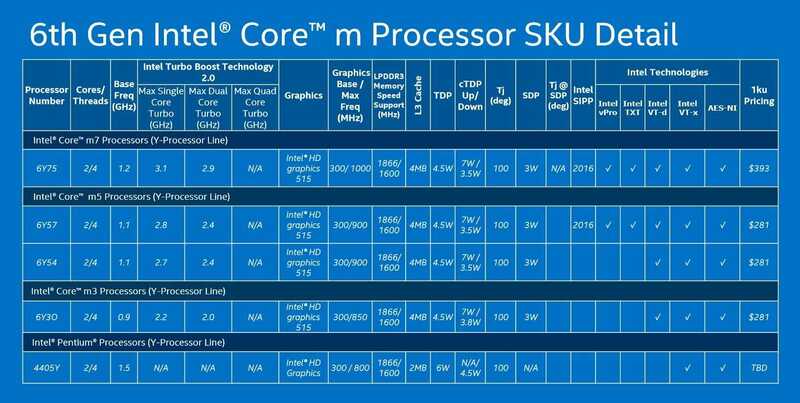 You’ll also note that there’s a Pentium Y-series under the Core m range. 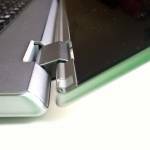 The 4405Y is going to be an interesting option for Chromebooks. The progress in the 2-in-1 market has been impressive. 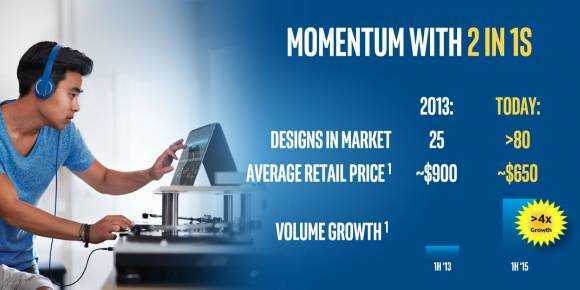 Intel say that there’s 60 designs in the market today and that prices go down to $650. Actually the prices go even lower than that and should continue to drop. We’ve got around 60 designs in our database today but we expect to see more this week and that’s the last point you need to know about the press release this morning. The gates are open for manufacturers. They can finally talk about new designs coming to the market over the next 6 months and you’ll see some of those as we progress through 2 full press days at IFA in Berlin. 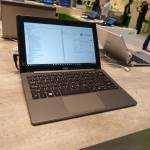 « The IFA 2015 kitlist and watchlist.